Candy Chair for Your Home. These chairs look soft and comfortable. Looks like candy with attractive pastel colors. 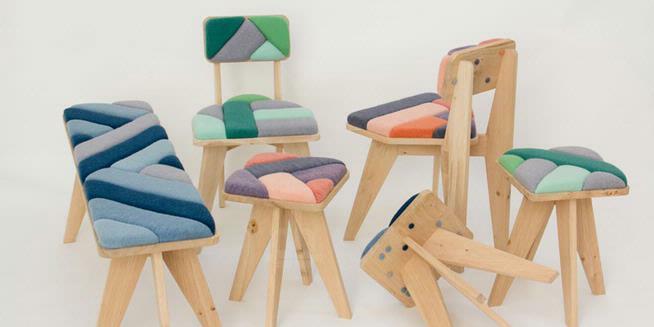 Interestingly, seat chairs are made using windmill technology and use natural dyes. As a result, in addition to gorgeous, these seats are also environmentally friendly. The seat making began in 2010. At that time, Merel Karhof build “Wild Knitting Factory”, a wind-powered knitting machine with turbine rotor blades in size more than one meter. windy Environmental conditions makes knitting activities become faster, while the wind speed is which is not too strong allowing more controlled production. In the first experiment, the Dutch designer is making a scarf. However, after exploring all possibility with product creation, Karhof expanded and began to make a variety of equipment for furniture seat and backrest. Initially, Karhof make different order furniture by using electric powered saws from the windmill. The furniture is then transferred to the windmill coloring and colored with natural dyes. In the dyeing process, the plant owned by Karhof will be knitting yarns knitted. As a result, chairs with some cushions representing the amount of time it takes the wind to make it. Finally, Karhof also has installed a system that allows the windmill at the factory to turn away from the direction the wind speed is too high. « Is your building energy efficient?